A pair of agate-handled fish servers with tines, by William Chawner London 1822, crested with 5 ears of wheat. 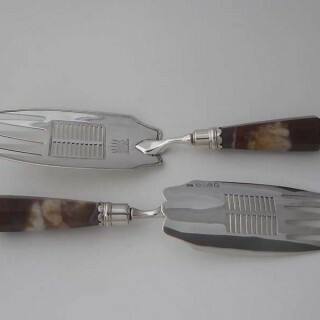 Seymour Rabinovitch on page 248 of “Antique Silver Servers for the Dining Table” (1991) comments that ‘a rare pair [ of slices with fork-ends] (William Chawner II, London, 1822) has recently resurfaced’. It was at about that time that this pair entered the private collection from which they are now being sold. 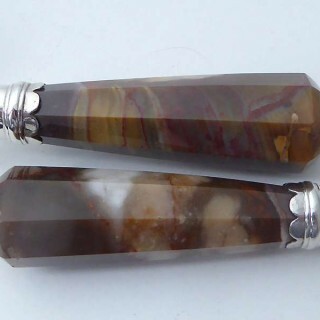 The condition of both the agate handles and the silver blades are without blemish. 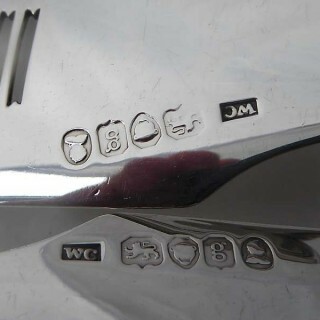 As can be seen from the images the marks are clear and easy to read.